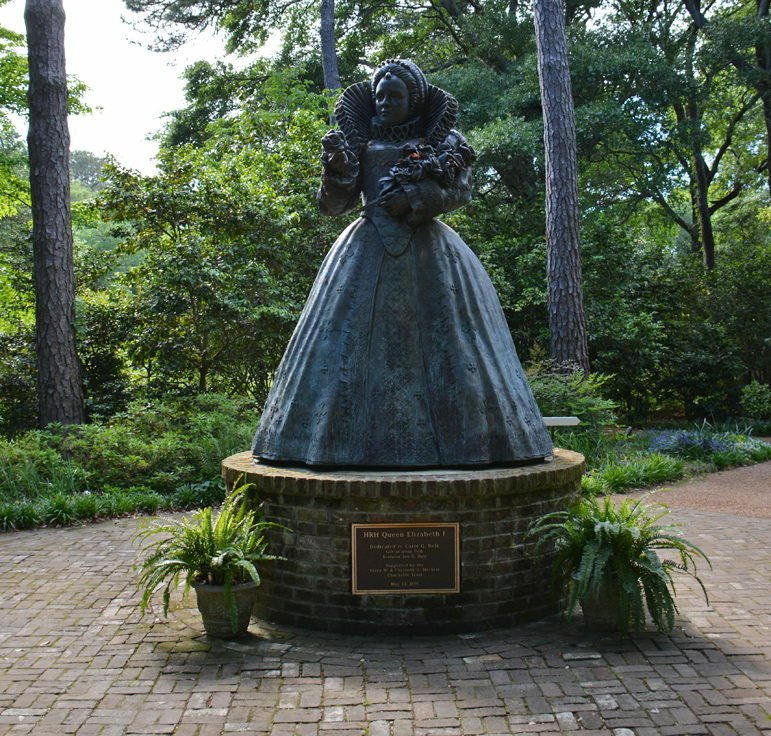 Virginia Dare is easily the Outer Banks' most famous resident, considering that a number of landmarks, locations, and attractions bear her name. From the Virginia Dare Memorial Bridge to the name of Dare County itself, This 1580s native has clearly left an undeniable impression, despite the fact that historical records suggest she was a Roanoke Island resident for less than three years. Her story, however brief, has nonetheless inspired countless works of art, literature, folklore, and even a made for TV science fiction movie, and her status as the first English child born in America has brought pride to generations of Outer Banks locals. On your next vacation, pay homage to this local legend with a crossing over the Virginia Dare Memorial Bridge, a visit to the Elizabeth II, or by heading to the Waterside Theater for a showing of The Lost Colony. Regardless of where a vacationer lands on the Outer Banks, it soon becomes apparent that Virginia Dare is everywhere, and her story and mystique lives on hundreds of years since she first arrived on the Outer Banks. Perhaps one of the reasons that so many artists and writers have taken creative liberties with the image and story of Virginia Dare over the centuries is because so little is known about her. Virginia's history begins with the marriage of her mother, Eleanor Dare, to a local bricklayer and tiler, Ananias Dare. Eleanor and Ananias were both born in London, Eleanor in 1563 and Ananias in 1560, and were married at the historic St. Bride's Church on London's Fleet Street. (A memorial to Virginia Dare was eventually built at the English church and can still be admired today.) Their story may have ended there, with no worldwide recognition, if it wasn't for the commission given to Eleanor's father, John White. In the 1580s, England began making colonization attempts in the New World, focusing on the northern and relatively undiscovered region that is present day America. Sir Walter Raleigh led the expeditions, under the command of Queen Elizabeth I, and after several successful trips to Roanoke Island, including an initial settlement of soldiers, sailors and workingmen that was sent to the colony in 1584, Raleigh deemed it was time to send a settlement of men, women and children to the New World. He named his friend and fellow explorer of the region, John White, as the new governor of this colony, and leader of the nearly 150 Englishmen and women who would sail across the ocean to create a permanent home on Roanoke Island. John White was a good choice, as he was the mapmaker for the very successful expedition to North Carolina led by Richard Greenville in 1585, (an expedition which led to the friendly treaties with Chiefs Manteo and Wanchese), and White was optimistic about the colony's potential success. This optimism is evident by the fact that he recruited and brought his own daughter and his son-in-law along as new Roanoke Island residents - Eleanor and Ananias Dare. White's optimism, however, may have been a bit premature. The first 1584 settlement of soldiers sent to Roanoke Island returned home little more than a year later due to dwindling supplies, and deteriorating relations with the local Native Americans. Apparently a fight between the settlers and the one of the local Native American tribes had led to months of animosity, and the settlers were concerned about an impending attack. So despite the fact that they had built homes, various buildings, and a fort, (Fort Raleigh), they deserted the colony and hitched a ride home back to England with Sir Francis Drake, who was passing through the area. John White and his band of settlers departed for the New World in 1587, with a pregnant Eleanor Dare included in the voyage, and landed on Roanoke Island on July 22, 1587. After unloading the ship, it soon became clear that establishing a permanent settlement was not going to be an easy endeavor. There were no soldiers or sailors from the original colony left behind to help the new arrivals adjust, and within days White realized just how bad the local Native American relations had become. While the colonists and White worried about their next move, and struggled to build better local relationships as well as a home in the foreign land, a glimmer of hope came into the colony. Eleanor Dare gave birth to a baby girl, Virginia Dare, on August 18th, 1587 - the first English citizen born in the New World. Virginia was baptized in the colony the following Sunday, and was noted to be strong and healthy, despite the desolate conditions of the new settlement. White was obviously delighted, but just a couple months after Virginia's birth, he realized that the colonists needed help in the form of fresh supplies and additional men to protect them from the hostile locals. He set sail back to England in late 1587, grudgingly leaving his new granddaughter behind, but planning to return within a year. Approximately 115 men, women and children were left to wait at the Roanoke Colony, including the infant Virginia. White, unfortunately, was stalled in England and unable to return promptly because of the ongoing Spanish War, and he wasn't able to set sail again until nearly three years later, arriving on Roanoke Island on Virginia's third birthday. White was heartbroken to discover, however, that his granddaughter and the entire colony was gone, with the majority of the settlement left perfectly intact and empty. One of the colonists had carved "CROATAN" and "CRO" into village trees, but other than this cryptic clue, there was no sign of where they had gone, or what had happened to them. White searched the coastline from Roanoke to Hatteras Island, but there was no sighting of the 115 men, women, children, and the Lost Colonists were never seen or heard from again. Virginia Dare, who had originally made news around the world as the first English child born in America, was now famous just three years later for her shocking and mysterious disappearance. In the centuries that followed, thousands of historians, artists and writers tried to unravel the mystery of Virginia's fate, but clearly, there were no answers in sight. This all changed, however, in 1937 - amazingly the year of Virginia's 350th birthday celebration - when hand carved stoned were found in Georgia and the Carolinas, dated and signed by Virginia's mother, Eleanor Dare. Within the next four years, a total of 48 stones were found, penned and signed by Eleanor Dare, and when put together, they chronicled a fascinating life in the wild after the colony disappeared. According to the stones, Eleanor's husband and daughter Virginia died in 1591 in a savage Indian attack, and hungry for revenge, Eleanor went on to marry a rival Native American Chief. She eventually gave birth to a second daughter named Agnes, and remained a tribe member until her death in 1599. Many historians found it quite unbelievable that these stones were uncovered, and as it turns out it was, though it took nearly a decade to prove without a doubt that the whole affair of the Dare stones was an elaborate hoax. While this is one of the few cases about Virginia's hypothetical fate trying to be passed off as the absolute truth, the stone carvers were certainly not the only folks in history to create stories and legends about the Roanoke Island resident. A number of novels have been written over the past centuries, with Virginia as a heroine who moves to Jamestown and marries a local settler, or is turned into a deer by an Indian witch doctor, or even gets involved in a love triangle with John Smith and Pocahontas. In science fiction works, she has been kidnapped by aliens or transformed into a modern vampire slayer, and in advertising she has been the face of a range of products from Virginia Tobacco to Flavoring Extracts. Clearly, despite her brief appearance in history, Virginia Dare is a celebrated figure in American culture. As an icon of America's earliest roots, and later a subject of its longest running mystery, this Outer Banks local continues to fascinate and inspire artists and visitors alike, even today. Because Virginia was born on Roanoke Island, the first colony in the United States, her names seems to shine brightest on the Outer Banks. Look around during your OBX travels, and you'll surely spot her name everywhere, from street names and bridges, stores and businesses, and even the name of the general region itself. When Dare County was officially incorporated in 1870, it was named after Virginia, and 130 years later when North Carolina's longest bridge was built stretching across the Croatan Sound, and creating a faster route from the mainland to Roanoke Island, her name was honored again by naming the new structure the "Virginia Dare Memorial Bridge." Virginia is also honored at annual birthday celebrations on Roanoke Island, with special super-sized events on distinctive birthdays. On her 350th birthday in 1937, the community of Roanoke Island launched a new play which they intended to run throughout the season of the birthday celebration entitled "The Lost Colony," a drama which has become a permanent and incredibly popular Outer Banks attraction. For her 400th birthday in 1987, the town of Manteo unveiled its newest site, the Elizabeth II, an exact, detailed replica of the 1580s sailing vessel that the pregnant Eleanor Dare had travelled to reach Roanoke Island. The Elizabeth II has also become a permanent attraction, greeting downtown Manteo visitors from her permanent home in Shallowbag Bay. Other Virginia Dare honors, which are slightly less visible, are scattered throughout the region as well. The Roanoke Island Festival Park has a working and interactive colony to introduce visitors to the hard life of the 1580s New World settlers, and the Elizabethan Gardens, also in Manteo, honors Virginia with a marble statue of an adult Virginia Dare, happily accustomed to her wild surroundings, with a fish net in one hand and a heron as an accompaniment. When the statue was originally carved in 1859 by an American artist, it was highly controversial for its wild proposal of Virginia's later life of growing up among Native Americans, and it wasn't until it found a home at the Elizabethan Gardens, (after a lengthy journey that included two years at the bottom of the ocean due to a shipwreck), that is was genuinely well-received and appreciated. While there are many versions and theories about what happened to Virginia and the rest of the colonists, the Outer Banks community tends to lean towards the widely accepted theory that the colonists simply moved south, to Hatteras Island, with the guidance of the Croatan Native Americans who were always friendly to the English explorers. In this version, Virginia Dare leads a happy life, growing up somewhat wild along the shoreline, and learning to adapt to the Outer Banks lifestyle. It is this version of events, as well as her iconic status in America, which makes her birthdays genuine celebrations, and has led to her immortalization as a legendary pioneer, and the Outer Banks' most beloved famous resident. While visiting the Outer Banks, vacationers with an appreciation of national history, or who simply love a good mystery, will find plenty of options for discovering more about Virginia Dare. Events are generally held on or around August 18th on Roanoke Island celebrating Virginia's birthday. These events can include a renaissance fair, traveling exhibits, and informational kiosks sponsored by the local Manteo attractions with volunteers on hand to provide more detail on what is known of the colonists' life and eventual fate. Open to everyone, a Virginia Dare birthday celebration is an entertaining way to learn more about the iconic Outer Banks figure. Past landmark celebrations have produced treasured Outer Banks attractions like The Lost Colony drama and the Elizabeth II, so you never know what the town of Manteo and the community will create to make the birthday celebration a commemorative and extra special event. For a look at the colonists' day to day life on the Outer Banks, and an in-depth exploration of terrain these settlers first encountered upon arriving, take a trip to Roanoke Island Festival Park and the Fort Raleigh National Historic Site. Both acclaimed attractions feature miles of wooded acreage bordering the Roanoke Sound, and are literally within walking distance of where the colonists originally landed and carved out their home. Featuring artifacts from the early expeditions and interactive exhibits on the local 1580s lifestyle, both the Roanoke Island Festival Park and Fort Raleigh National Historic Site are essential attractions for visitors who want to visit the world that Virginia Dare was born into. The best way to explore a first-hand telling of Virginia's story is to take in the critically acclaimed Lost Colony show at the Waterside Theater in Manteo. Performed every night in the summertime, this drama was first originated as the centerpiece of Virginia Dare's 1937 birthday celebration, and is now the longest running outdoor drama in the country. Visitors can also climb aboard the Elizabeth II for an inside look at the conditions that a very pregnant Eleanor Dare had to live with en route to her new home in the New World. Filled with costumed interpreters and intricate detail, the Elizabeth II showcases just how brave the colonists were as they headed full speed into an unknown future. Virginia Dare is an icon around the Outer Banks, and visitors with a keen eye will notice her presence everywhere they go. From street signs to local businesses, Virginia's presence is everywhere, and the local community takes great pride in their designation as Virginia's hometown. Though her fate is currently and will most likely always be unknown, her legacy is undeniable, and visitors are encouraged to explore the regions, attractions and works that celebrate Virginia as an iconic Outer Banks resident, and a story of hope and exploration that everyone can be inspired by.